The first three pages of RITES OF SPRING are now available to read on my permasite, here. I've got a gig at East Sheen Library this Thursday evening, 30th March, 7.30pm. I'll be introducing RITES OF SPRING and saying a few words about how it found its way into print; and the actress Geraldine Moffatt, whom you may have seen in 'Get Carter' with Michael Caine, will be reading extracts from it. Hot-off-the-press copies available to buy, too, with author on hand to sign them. The £2 entry fee includes a glass of wine. East Sheen Library is at the Sheen Lane Centre, Sheen Lane, London SW14, about one minute's walk from Mortlake station (South West Trains, 22 mins from Waterloo). This, published today in the Independent, has been really quite thrilling. A number of the specialist magazines have picked up on it, but I've been fortunate to be able to take it mainstream in the national press. Having been treated to a sneak preview of the Violin Concerto recording, I know, too, that it is simply stunning. They stage a trick: they market a classical string quartet to a primary school of multiethnic kids as the latest rap sensation, Wolf Gang. They bring one band member, a beautiful, glamorous black girl, to visit the school. There's merchandise - stickers, t-shirts, you name it - which the kids lap up; and she rolls up in a stretch limo, exquisitely dressed, to be met with shouts and screams and many small hands reaching out to beg for autographs. The children think it's the coolest thing ever. A little later, the kids are told what music this band actually plays. Have they heard it? No, of course not. They just fell for the marketing. Lessons there, classical comrades. Should we make graffiti-style I heart THE LPO t-shirts, sold at as high a price as possible so that people think they're valuable? Should we have stickers bearing pictures of... um...OK, Helene Grimaud, on sale at designer outlets? Should we drive her, or Julia Fischer, or Lisa Batiashvili, or Gabriela Montero, or whoever, to visit a primary school in a stretch limo - not to play music and make kids listen, but to wave, smile and preen, getting the message across that this is a beautiful superstar whose autograph it's worth having? Would it really help? What do you think? UPDATE, 7.15pm: I've had a stroke of inspiration. It's often said that classical musicians need to 'ditch the penguin suits'. Various orchestras have tried other uniforms: black trousers and shirts (looks like they're not actually there), bright shirts & jeans (looks naff) etc etc. What they need is this: designer wear. It doesn't much matter which label, as long as it's famous. Let's try dressing the LPO from top to toe in identical Armani outfits & see what happens. Unfortunately, nobody in the LPO can currently afford an Armani suit, so the company would have to be prevailed upon to hand 'em over free, or much reduced, as sponsorship. It's 13th March 2006. Publication day! As from now, my novel is available all over the Commonwealth, and that slot on the bookshelf that I spotted as a kid - somewhere between Drabble and Du Maurier - will at last be occupied by RITES OF SPRING. Is it possible to know, when you're 10 years old, that one day in 30 years' time there will be a 13th March 2006, there will be a book on a shelf, and the dream everyone says is just a dream will become real? Actually, if anybody had told me then, I'd simply have been horrified to think that it was going to take 30 years. Tom, the lucky old thing, is in San Francisco today as the LPO is in the middle of a three-week tour of the US. Kurt Masur went off sick the day before the tour began, unfortunately (rumours of high blood pressure, which I can't confirm), and Osmo Vanska stepped in for the first few gigs, with Masur's assistant Minchuk taking over for the rest of California. I have 13th March all to myself here in London. It's a suitably spring-like morning: very cold, but bright, with that pale, silvery sunshine that's unique to March. What shall I do with my special celebratory day? The answer is easy: get on with the next book. I can't believe I did this. But today I went against all my principles and bought The Daily Telegraph. It's a newspaper that I feel takes a political stance light years away from anything I find vaguely acceptable. But today was different, because - dreadful admission - I fell for the special offer. But the ultimate pull of INTERMEZZO, for me, is the last word in slidey violins: a sound-track featuring Toscha Seidel. Seidel was a classmate of Heifetz's, studying with Auer: while Heifetz was described as the angel, Seidel was the devil. Guess which one has the hot sound, the burning tone, the passion that sings out that bit too far? Heifetz, beside Seidel, sounds cool as the proverbial cucumber. Toscha had some measure of success, but was constantly overshadowed by Jascha's - though a song by George and Ira Gershwin about a bunch of leading violinists went 'Mischa, Jascha, Toscha, Sascha, we're four fiddlers three!' Seidel ended up in Hollywood, like so many amazing European musicians; and he recorded Korngold's suite from 'Much Ado About Nothing' with the composer at the piano (available on Biddulph Records). If you love Korngold for his emotional generosity and overblown, sensual heart, you will love Seidel too; and if you love slidey violins, you will find none slidier. Naturally, with my fiddle fetish, I can't resist him for a moment. So, dear friends and editors forgive me, I compromised my reputation by buying the Telegraph. Rest assured, however, that I did not read it. 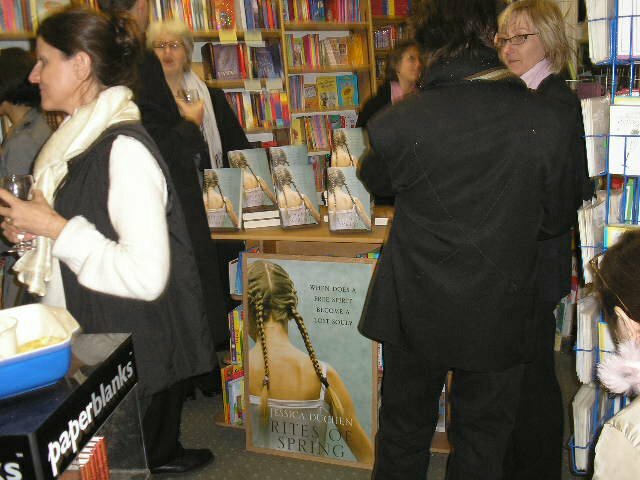 RITES OF SPRING was officially launched on Wednesday evening. More pics at my permasite. First of all, a big thank-you to All About Opera, which has kindly made this blog its Featured Site for the month of March. Quite apart from that, it's a useful, informative resource and all opera buffs should check in and explore it. Brilliant sunshine here in London today. Perhaps spring is on the way at last, despite the snow in the north. Solti saw fit to leave the bed this morning and went outside for a whole two hours, so something must be changing.